Shark has a great flavor, and you'll want to get the most out of it you can, so the marinade in this recipe for grilled shark steaks has a low profile so it won't overpower the fish. While these steaks are meant to be served as is, you also can shred them and put them in tacos, soups, stews, or wraps. In a small bowl, whisk together soy sauce, ketchup, orange juice, chopped parsley or cilantro, lemon juice, minced garlic, black pepper, salt, and red pepper flakes. Place fish in a shallow baking dish and pour marinade over the top. Using tongs, turn shark steaks to coat well. Cover with plastic wrap and marinate in the refrigerator for 1 to 2 hours. Heat grill to medium-high heat. Right before placing fish on the grill, oil the grill grates using a pair of outdoor cooking tongs, folded paper towels, and a high smoke-point oil (like peanut oil). Make about 3 to 4 passes across the grates to ensure a nonstick cooking surface. This is important when grilling fish since it tends to fall apart if conditions aren't quite right. Remove fish from marinade, reserving marinade. Place marinade in a saucepan and bring to a high simmer for 2 minutes, stirring often. Reduce heat to medium-low and let simmer for 10 to 12 minutes. Remove from heat and cover to keep the sauce warm. Place fish on the grill and cook for 5 to 6 minutes per side or until fish reaches an internal temperature of 145 F and flakes easily when tested with a fork. Once cooked, remove shark steaks from grill and serve with sauce. Due to the overfishing of shark, make sure you purchase your fish from a responsible and reputable monger that is aware of the strict guidelines in place for harvesting this fish. Shark is a lean fish, so treat it with respect. If you purchase thick shark steaks, they are ideal for grilling in the same way swordfish or salmon steaks are cooked. Marinating this low-fat fish helps it to retain moisture and tenderness through the cooking process. Another method is to poach it in milk, wine, water, or broth for a few minutes before throwing it on the grill so it isn't subjected to a lot of drying heat but still gets the charcoal flavor and much-desired grill marks. This is another good method to cook shark steaks. Just oil a cast-iron skillet and heat it until the oil shimmers but isn't smoking. Carefully add the steaks and reduce the heat. Cook them, turning only once, for a total of 10 to 12 minutes depending on their thickness. Remove to a plate and let them rest. Make a sauce with the pan juices by adding 1/4 cup white wine or broth and reducing it for 3 to 5 minutes. 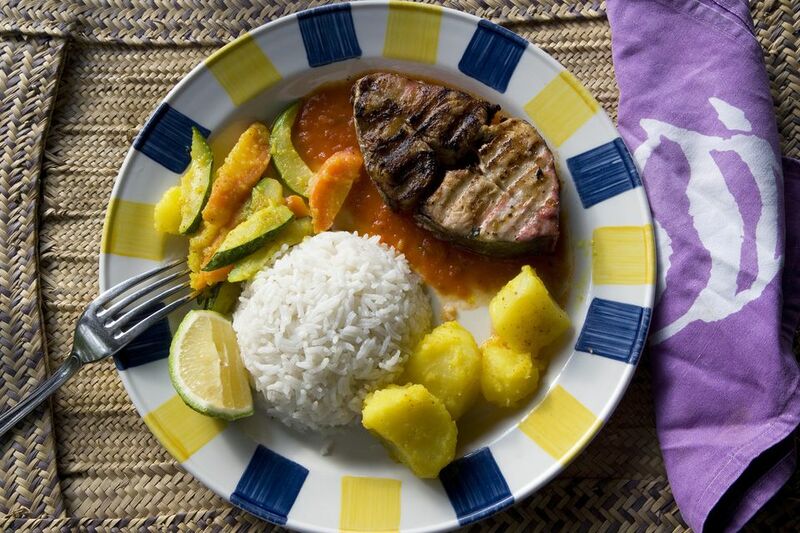 Yet another way of enjoying shark steaks is to cut them into thick cubes, marinate in a citrus blend, and skewer them with baby potatoes, cherry tomatoes, red peppers, red onion, pineapple chunks or whatever your heart desires. They are grill friendly but also can be baked in the oven. Serve with fruit salsa for a taste of the islands.